The 2015/2016 crop production summer season was defined as one of the worst droughts in a few generations of farmers. Some family farms might even be forced to cease farming or join up into large commercial farming units. This last year farmers were faced with an almost ultimate risk event which has been devastating in many instances. The small or family producer will also need to assess their production methods and see were further efficiencies can be implemented. 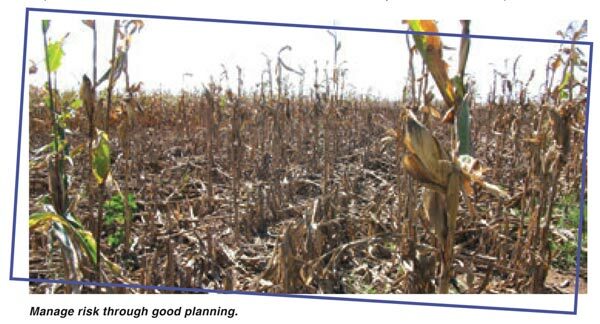 Those who have come through with a reasonable late planted crop of maize, sunflowers or teff for seed and hay in some production areas will be faced, during August, with the detailed planning for the next season. Financial and operational business plans will need to be presented by farm owners and managers to banks, commercial co-operatives and board members to motivate for funding of this critical next crop. Producing enough maize to enable the price to return to levels where agricultural enterprises can once again make profits will be very important to the agricultural sector and the country next year. The successes and failures of the current season must be assessed very carefully so that the least risk operating plan for 2016/2017 can be put together. Risk can be defined as any uncertainty that affects an individual's or business welfare and is often associated with adversity and loss. There are many sources of risk in agriculture ranging from crop price and yield risk to personal injury or poor health. Risk management involves choosing among several alternatives that have been proven to work in your farming operation over past production years. Critical management and implementation of the right enterprises chosen in order to reduce the effects of the various types of risks to be encountered is required. Under the current circumstances farmers need to stick to proven production practices on a few enterprises that have done well. Now is not the time for experimentation by going into enterprises where future risk assessment is not well known. Stick to what you know for now! 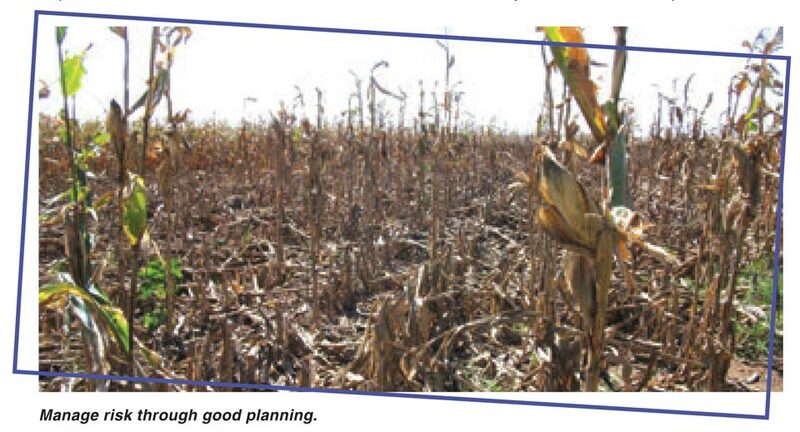 This last year certainly highlighted the difference between farmers that could manage production methods that conserved moisture in a crop fallow or a range of conservation farming methods from reduced tillage to full on no-till farming. Soils must be assessed for compaction and fertility. During August livestock, if included in the farming enterprise, must be managed in order to reduce any possible compaction on the lands to be used this season. The lands to be planted should be worked as soon as possible to bring the soil surface into a state were planting can take place timeously. Make sure that your existing tractors and cultivation equipment and planters are in excellent condition. Use what you have and put tractor replacement off if possible. Many areas have received enough rainfall to top up the moisture in the soil profile. It will be critical to conserve this condition so that planting of the coming crop can be done on time with a minimum of early summer rainfall required. Only use your best and well prepared soils that can be optimally utilised within your mechanisation capacity. One of the highest risks created in crop farming is undertaking to plant more land area than your existing tractors and equipment can handle. As fertiliser is one of the highest components in your gross margin cost analysis it is prudent to test all soils so that the least cost fertilisation programme can be used. Where there have been total crop failures, reduced rainfall and leaching of soil nutrients, Nitrogen in particular will be minimal. Only use fertilisation levels that will compensate this year's planned potential yield within the average yield obtained over the years. Put off building phosphate levels and liming of lands until the next crop income has been realised and assessed. Do detailed costings on all the main crops to be considered and cut on fertiliser as mentioned above and chemical costs if possible. Only plant crops that have a proven production record on your farm and that have shown to be the most drought resistant. In some areas farmers intend to reduce the hectares planted to soybeans in favour of sunflowers or teff to reduce future production and income risk. The futures market prices in July 2017 for the various crop commodities are shown below and can be used as a guideline for planning and assessing which crops you should plant. White maize R3 184, yellow maize R3 011, wheat (December 2017) R4 778, sunflowers (May 2017) R6 590, soybeans (May 2017) R7 056 and sorghum at R3 680. Remember to take off the silo differential value for your area from the future maize price to get to the 'spot' or farmers pocket income per ton of product. The differential calculation is not taken into account for the soybean futures price. Carry out a proper risk assessment of all relevant factors and farm within your management capability, mechanisation level and remaining financial resources.